Slender to stout root, but this species does not have a long taproot. Catsear and hawkbit (and dandelion) are perennial, sending up new flowering shoots each year. Hawksbeard, by contrast, has an annual or biennial life history. A very common weed of lawns but also common in grassland, pastures, sand dunes and river beds. The rosette rises from a taproot and dies after one or two years. The true dandelion (Taraxacum officinale),is distinguished by its single large, bright golden-yellow flower head, 3-5 cm in diameter, borne at the top of a relatively short, leafless, hollow stem containing milky sap. Its leaves bleed white sap if broken and it has a thick, fleshy taproot which will regrow from severed pieces. 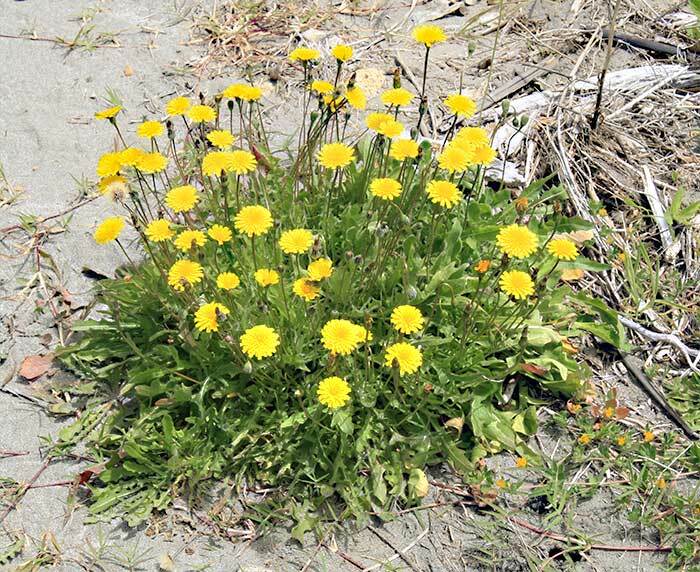 Three other species of Crepis – Crepis foetida, Crepis setosa, and Crepis vesicaria are found in New Zealand, but the first of these is of extremely limited distribution. Crepis setosa (bristly hawkweed) has rough-hairy leaves, leafy stems and beaked seeds and is sometimes common on roadsides and waste places in a few areas of the North and South Islands. Crepis vesicaria (beaked hawksbeard) has thicker, hairier leaves and beaked seeds and is found in lucerne and hay crops, pasture, unmown roadsides and waste places, mostly on the east side of both islands. 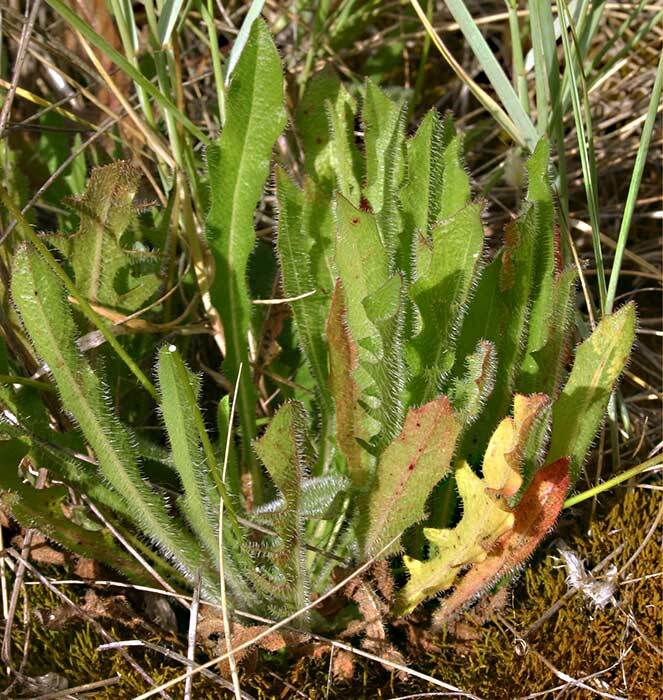 One other species of Hypochaeris found in New Zealand is Hypochaeris glabra (smooth catsear). Smooth catsear is quite rare. It is a smaller plant, an annual, and has hairless, red-blotched leaves. 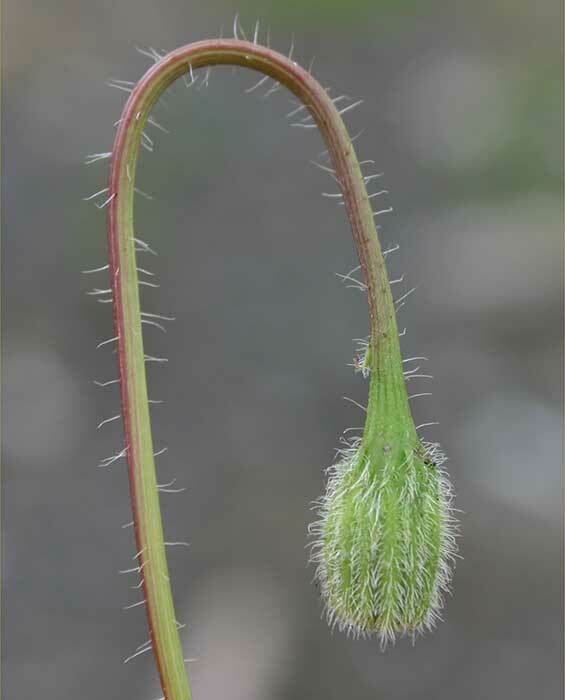 The best distinguishing feature between the two species is the row of sharp, more or less flattened hairs on the mid-rib of the involucral bracts (the tiny green leaves at the base of the flower head). Smooth catsear is found scattered throughout the country in grasslands, pasture, dunes, gardens and waste areas. 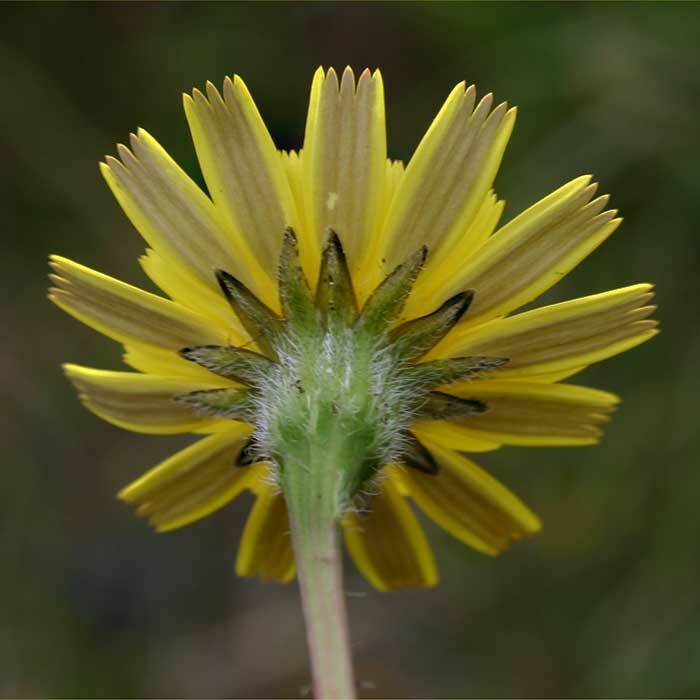 Another species of Leontodon – autumnalis (autumn hawkbit) occurs here but it is also rare. It has shiny narrow rosette leaves that are often deeply lobed and are either hairless or with simple (unforked) hairs. There is more than one flower head per stem and it has a stout rootstock. It occurs in pasture, waste land, costal sand and river beds in higher rainfall areas of Otago and Southland. It appeared in New Zealand in the early days of European settlement, presumably brought here as a contaminant in pasture seed, in the vegetable stuffing of mattresses, or in imported hay and straw. It is a member of the daisy family and has an umbrella-like pappus attached to the wind-dispersed seed. Its deep rooted taproot helps it to survive in drought conditions. Hawbit is rarely found in annual crops but can be a serious problem in perennial crops such as lucerne. It sometimes appears in cultivated gardens and is common in lawns. It often has the greatest impact in lawns where it looks unsightly, both as flattened rosettes in winter and as tall-growing flower stalks over summer. Hawbit is usually found in grassland, waste places or on bare soil but can also be found along paths and clearings in bush where it may interfere with the regeneration of native species. Maintaining a dense pasture by sowing appropriate grasses and clovers for the area, and grazing the pasture to maintain density will reduce the chances of this flat weed becoming established. Care must be taken with herbicides containing clopyralid as it does not degrade in compost. Therefore lawn clippings MUST NOT be used in compost bins for at least 6 months after clopyralid application as the compost itself will kill broad-leaved plants when used in the garden. Herbicide application in early spring will then give effective control.